.MODEL is the six-character keyword ".MODEL"
mtype is a five-character keyword equal to either "VPWLR" or "IPWLR"
x0 is a floating-point number which defines the value of X0 in volts. x1 is a floating-point number which defines the value of X1 in volts. y1 is a floating-point number which defines the value of Y1 in amperes. x2 is a floating-point number which defines the value of X2 in volts. xk is a floating-point number which defines the value of Xk in volts. yk is a floating-point number which defines the value of Yk in amperes, so that the straight line starting at the break point (xk???MATH???-1???MATH?? ?, yk???MATH???-1???MATH???) and passing through the point (xk, yk) forms the last segment of the piecewise-linear characteristic. The slope of each line segment on the v-i plane is the differential conductance in Siemens for the device. The small-signal resistance is then the reciprocal of the differential conductance. Values of the voltages must be entered in a strictly ascending order: ???MATH?? ?x0 < x1 < x2 < ... < xk ???MATH??? The slopes of the first and last segments must be positive: ???MATH?? ?y0 < y1???MATH??? and ???MATH?? ?yk-1 < yk ???MATH??? Other than the first and the last segments, each intermediate segment j has two break points and is defined for voltages in the range of ???MATH?? ?xj-1 \leq v \leq xj???MATH???. The first segment has one break point at (x1, y1) and is defined for voltages in the range of ???MATH?? ?v \leq x1???MATH???. The last segment has one break point at (???MATH???xk-1???MATH?? ?, ???MATH???yk-1???MATH???) and is defined for voltages in the range of ???MATH?? ?xk-1 \leq v???MATH???. As such, (x0, y0) and (xk, yk) are used to define the slopes of the first and last segments instead of being used to define their break points. As an example, the diagram below shows the v-i characteristics of an ordinary pn-junction diode and that of a tunnel diode. It is apparent from the diagram that the characteristics of these two devices satisfy the voltage-defined requirement and each of these two devices can be modeled by a VPWLR-type piecewise-linear resistor. 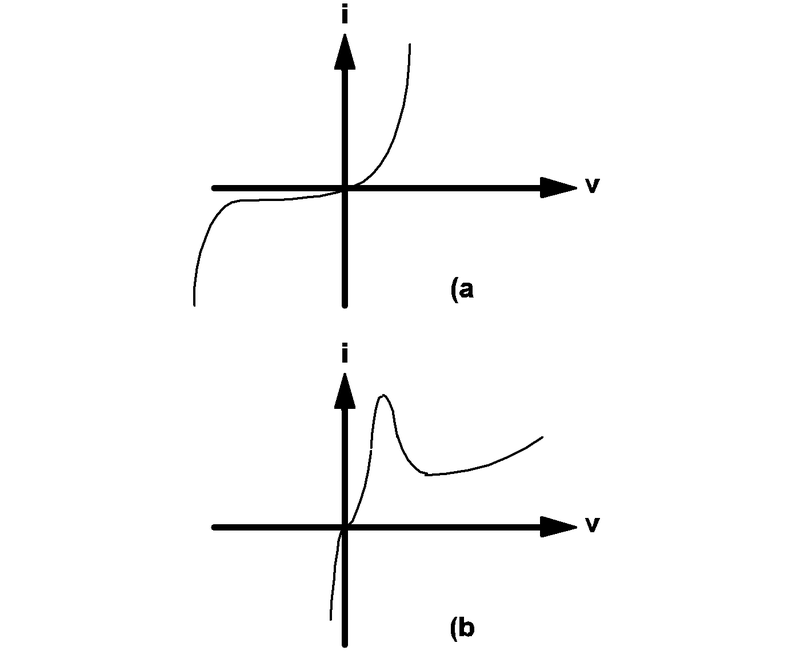 4.1 The v-i characteristics of (a) an ordinary pn-junction diode and (b) a tunnel diode. Values of the currents must be entered in a strictly ascending order: ???MATH?? ?y0 < y1 < y2 ... < yk ???MATH??? The slopes of the first and last segments must be positive: ???MATH?? ?x0 < x1???MATH??? and ???MATH?? ?xk -1 < xk???MATH??? Other than the first and the last segments, each intermediate segment j has two break points and is defined for currents in the range of ???MATH?? ?yj -1 \leq i \leq yj???MATH???. The first segment has one break point at (x1, y1) and is defined for currents in the range of ???MATH?? ?i \leq y1???MATH???. The last segment has one break point at (???MATH???xj-1???MATH?? ?, ???MATH???yj-1???MATH???) and is defined for currents in the range of i ???MATH?? ?yk - 1???MATH???. The two points (x0, y0) and (xk, yk) are used in conjunction with (x1, y1) and (???MATH???xk-1???MATH?? ?, ???MATH???yk-1???MATH???) to define the slopes of the first and the last segments of the characteristics. For example, the v-i characteristics of the ordinary pn-junction diode shown in diagram 4.1(a) above and the v-i characteristics shown in diagram 4.2 can both be considered to behave as nonlinear current-defined resistors. Therefore, each can be approximated by an IPWLR-type model. On the other hand, the tunnel diode characteristics shown in diagram 4.1(b) cannot be modeled by an IPWLR-type model since the values for the branch voltage are not uniquely defined for every value of current. Similarly, the v-i characteristics shown in 4.2 cannot be modeled by a VPLWR-type model. 4.2 Example of a type of v-i characteristics that can be described as a current-defined resistor. The model statements for piecewise-linear inductors and capacitors are very similar to those for the piecewise-linear resistors. In the case of a piecewise-linear resistor, its characteristics are defined in terms of points on the current vs voltage plane. 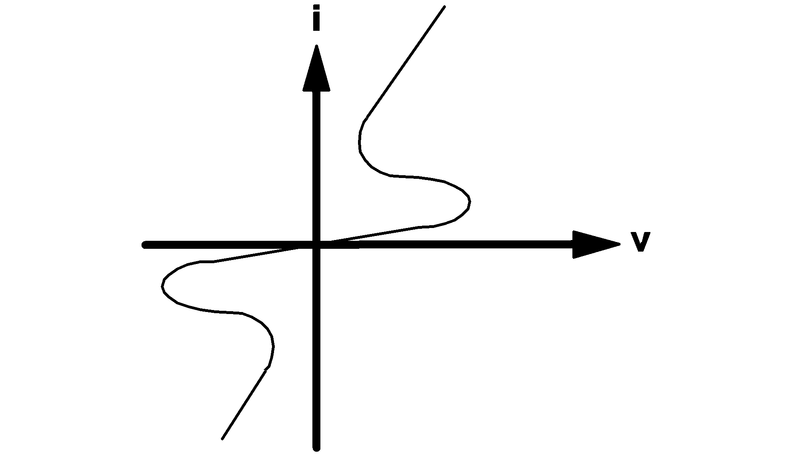 In the case of a piecewise-linear inductor, the characteristics are defined in terms of points on the flux-linkage vs. current plane. In the case of a piecewise-linear capacitor, the characteristics are defined in terms of points on the charge vs voltage plane. x0 is a floating-point number which defines the value of X0 and has units of amperes for a PWL inductor and volts for a PWL capacitor. x2 is a floating-point number which defines the value of X2. xk is a floating-point number which defines the value of Xk. yk is a floating-point number which defines the value of Yk. model type ICSW for a current-controlled switch. hystwd is a positive floating-point number which defines the hysteresis width of the controlling signal and has the same unit of measurement as that of threshold. LOGIC= is the six-character keyword "LOGIC="
POS is the three-character string "POS"
NEG is the three-character string "NEG". If the model type is VCSW, the controlling signal cs(t) for the simple switch is the voltage of a pair of controlling nodes or the branch voltage of a controlling device. If the model type is ICSW, the controlling signal cs(t) for the simple switch is the branch current of a controlling device. The diagram below defines the state of the simple switch, under two operating modes. If LOGIC is assigned the value POS, the switching of the simple switch is defined by (a). If LOGIC is assigned the value NEG, the switching logic is reversed, and the state of the simple switch is then defined by (b). When a simple switch is in the closed state, it is modeled by a linear resistor having a resistance equal to ron between its positive node and negative node. When the simple switch is in the open state, the resistance of the linear resistor changes to roff. 4.3 State diagram of the simple switch when the parameter LOGIC is assigned a value of (a) POS or (b) NEG. a set of two current-controlled models, designated as ICQPOS and ICQNEG. mtype is a six-character keyword equal to one of the following keywords: "VCQPOS", "VCQNEG", "ICQPOS", and "ICQNEG"
VSAT= is the five-character keyword "VSAT="
RSAT= is the five-character keyword "RSAT="
ROFF= is the five-character keyword "ROFF="
GAIN= is the five-character keyword "GAIN="
TH= is the three-character keyword "TH="
HYSTWD= is the seven-character keyword "HYSTWD="
POS is the three-character keyword "POS"
LEVEL= is the six-character keyword "LEVEL="
If the model type is VCQPOS or VCQNEG, the controlling signal cs(t) for the simple transistor switch is the voltage of a pair of controlling nodes or the branch voltage of a controlling device. If the model type is ICQPOS or ICQNEG, the controlling signal cs(t) for the simple transistor switch is the branch current of a controlling device. For model types VCQPOS and ICQPOS, the voltage across the transistor switch, measured as the voltage of the positive node with respect to the voltage of the negative node, assumes nonnegative values under normal operation like an NPN bipolar transistor and an N-channel MOSFET. For model types VCQNEG and ICQNEG, the voltage across the transistor switch, measured as the voltage of the positive node with respect to the voltage of the negative node, assumes non positive values under normal operation like a PNP bipolar transistor and a P-channel MOSFET. When a simple transistor switch is modeled with the LEVEL parameter set to 1, it can assume either an open or a closed state. The switching diagram in 4.3 (a) applies when LOGIC is set to POS while the switching diagram in 4.3 (b) applies when LOGIC is set to NEG. The only difference between a simple switch and a simple transistor switch with LEVEL set to 1 is the model of the closed state. When a simple transistor switch with LEVEL set to 1 is in the closed state, it is modeled by a linear resistor with the value rsat in series with a constant voltage source with the value vsat. When the simple transistor switch is in the open state, it is modeled by a resistor with the value roff. The block diagram and the V-I characteristic of the model are shown in Figure 4.4. The circuit element model of the simple transistor switch with LEVEL set to 1 for the closed and open states are shown in diagram 4.4 below. 4.4 Model for the simple transistor switch: (a) Simple transistor switch controlled by a control signal cs(t), (b) the i Q vs v Q characteristic of the simple POS-type transistor switch, and (c) the i Q vs v Q characteristic of	the simple NEG-type transistor switch. 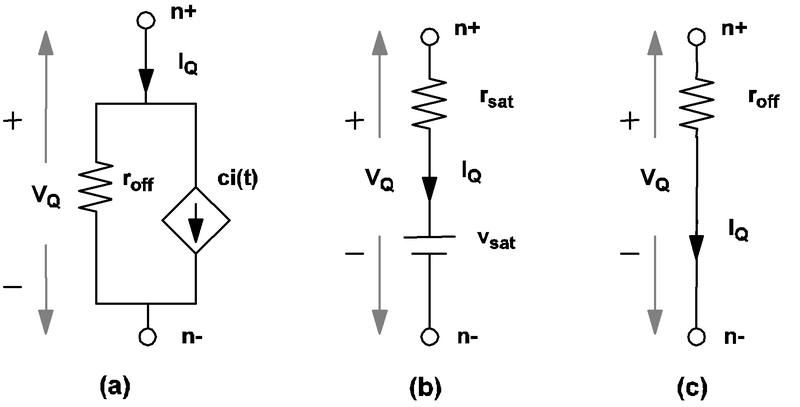 4.5 Model for the simple transistor switch: (a) model of the simple transistor switch for LEVEL=1 when it is in a closed state, and (b) model of the simple transistor switch for LEVEL=1 when it is in an open state. If a physical transistor is being driven to act like a switch and detailed waveforms of the voltage across the transistor and the current through the transistor are not critically important, it is recommended that such a transistor be modeled by a simple transistor switch with the parameter LEVEL set to 1 since the simulation is faster when a transistor switch has LEVEL set to 1. When a simple transistor switch is modeled with the LEVEL parameter set to 1, the value of the GAIN parameter has no effect on the modeling. In addition, the direction of current flow through the transistor switch is not restricted and the device behaves more like a controlled switch than a physical transistor. 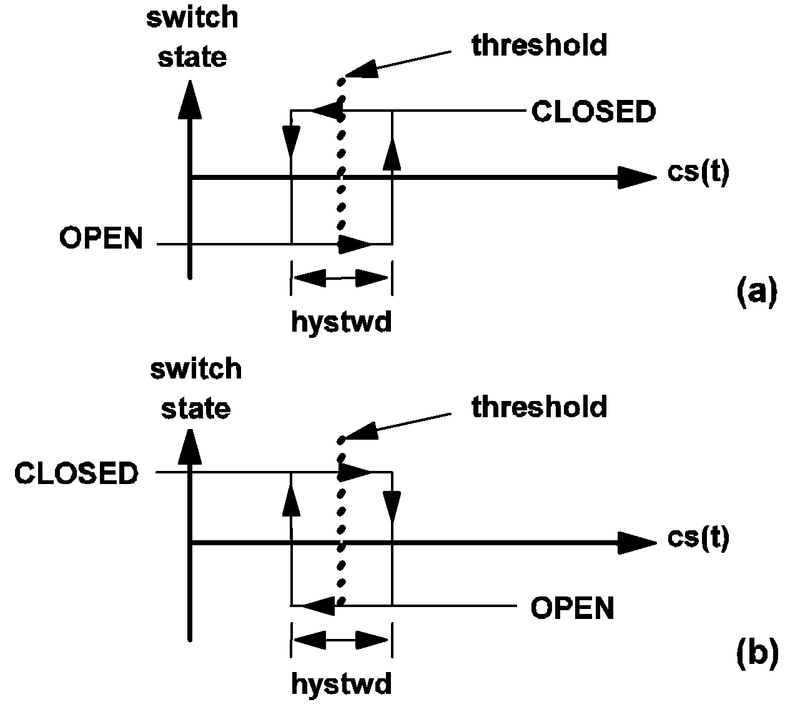 When a simple transistor switch is modeled with the LEVEL parameter set to 2, it still assumes either an open state or a closed state. The switching diagram in 4.3(a) still applies when LOGIC is set to POS while the switching diagram in 4.3 (b) still applies when LOGIC is set to NEG. When the LEVEL parameter is set to 2, the simple transistor is still modeled by a resistor with a resistance equal to roff when it is in the open state. When the simple transistor switch is in the closed state, additional secondary states are provided for the simple transistor, allowing the modeling of a physical transistor at operating areas where both the voltage across and the current through the transistor are simultaneously substantial. For bipolar transistors, such operating areas are collectively called the active region. 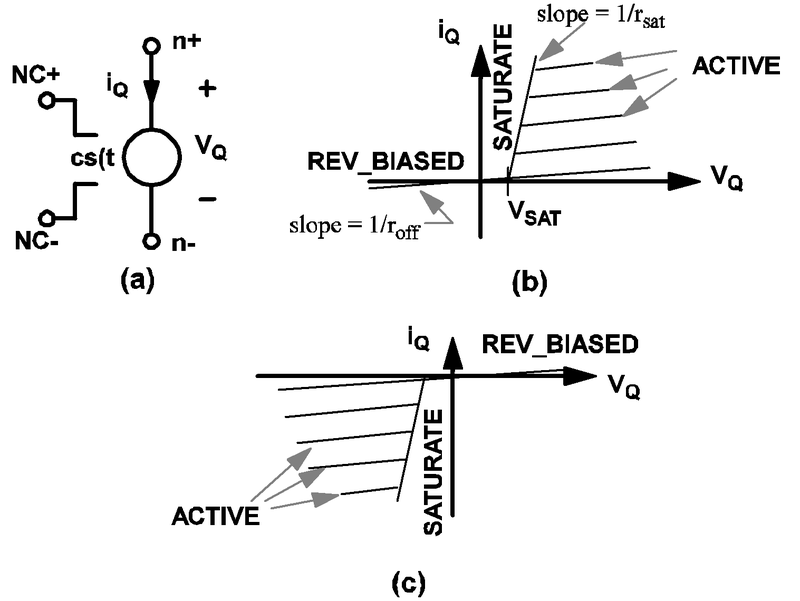 For the simple transistor switch the individual states are called ACTIVE, SATURATE, and REV_BIASED, to stand for active region, saturation, and reversed-biased, as indicated in 4.6 . SIMPLIS internally computes the voltage across and the current through the simple transistor switch to determine the correct secondary state at which the transistor switch should operate. 4.6 Model for the simple transistor switch for LEVEL=2. 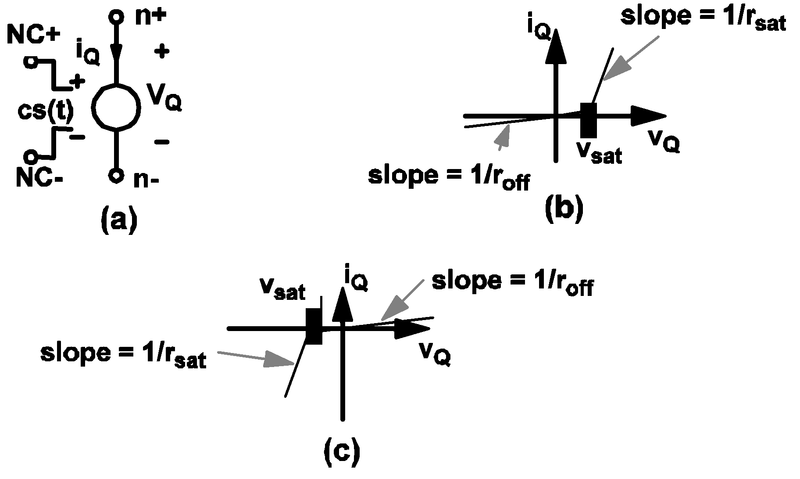 (a) A simple transistor switch controlled by a control signal cs(t), (b) The i Q vs v Q characteristics of a VCQPOS-type or ICQPOS-type transistor switch, (c) The i Q vs v Q characteristic of a VCQNEG-type or ICQNEG-type transistor switch. For example, an NPN transistor can be modeled by a piecewise-linear resistor to represent the base-emitter characteristics and an ICQPOS-type simple transistor switch with LEVEL and LOGIC set to 2 and POS, respectively, to represent the collector-emitter characteristics. Similarly, the collector-emitter characteristics of a PNP transistor can be modeled by an ICQNEG-type transistor switch with LEVEL and LOGIC set to 2 and NEG, respectively. 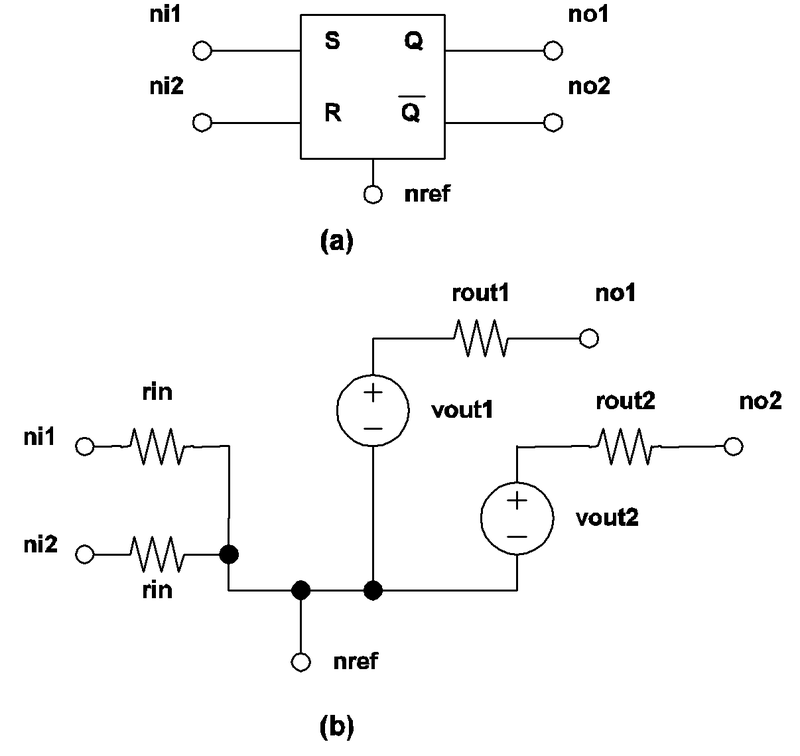 When the secondary state of a simple transistor switch is equal to SATURATE, it is modeled by the small network as shown in 4.7(b), which comprises a linear resistor with a resistance equal to rsat in series with a voltage source with source value vsat. 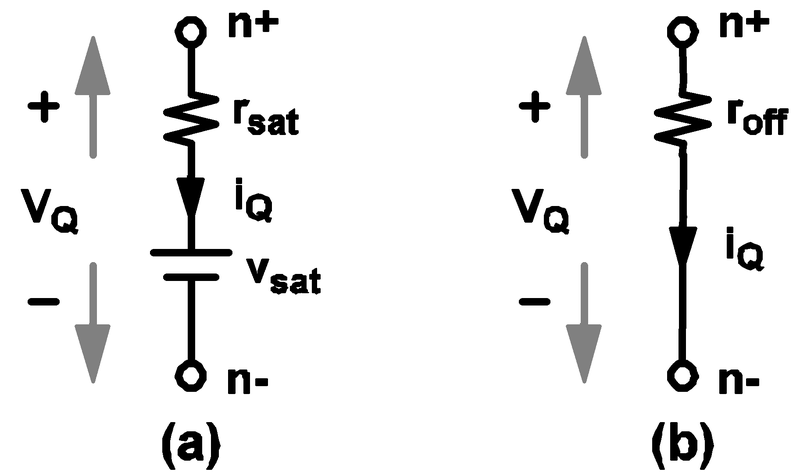 When the secondary state of a simple transistor switch is equal to REV_BIASED, it is modeled by a large resistor with resistance equal to roff as shown in 4.7 (c). 4.7 Model of a simple transistor switch in the closed state, with LEVEL=2. (a) Model for the ACTIVE secondary state, (b) Model for the SATURATE secondary state, (c) Model for the REV_BIASED secondary state. By selecting LEVEL=2 in the simple transistor switch model, you can more accurately model a physical transistor and are able to obtain more detailed waveforms on the voltage and current for the device. The penalty is an increase in the simulation time since more variables need to be monitored and computed throughout the simulation. To aid the understanding of the models for simple logic devices, the concept of "positive" and "negative" logic is discussed first. Except for inverters and comparators, all logic gates use a parameter called LOGIC in the model statement. The purpose of this parameter is to define whether a "positive logic" or a "negative logic" convention is used in defining the logic states. where ni and nref are the node names of the input node and reference node, respectively. The output logic state is equal to the result of the boolean operator associated with the gate applied to the input logic states. If the output state is equal to logic 1, the value of the voltage source in the output circuit is set to voh. If the output state is equal to logic 0, the value of the voltage source in the output circuit is set to vol. The two parameters vol and voh are specified in the model statement. The output logic state is equal to the result of the boolean operator associated with the gate applied to the input logic states. If the output state is equal to logic 1, the value of the voltage source, vout, in the output circuit is set to vol. If the output state is equal to logic 0, the value of vout is set to voh. VOL= is the four-character keyword "VOL="
VOH= is the four-character keyword "VOH="
RIN= is the four-character keyword "RIN="
ROUT= is the five-character keyword "ROUT="
rout is a floating-point number which defines the output resistance in ohms. The actual model implemented in SIMPLIS for an inverter is shown in 4.8 (b). The input circuit is represented by a linear resistor of resistance rin placed between the input and reference nodes. The output circuit is modeled by a Thevenin equivalent network between the output and reference nodes. The value of resistance for the resistor in the Thevenin network is equal to rout. The value of the voltage source in the Thevenin network depends on the output state of the inverter. 4.8 SIMPLIS inverter model: (a) Symbol for inverter, (b) Model for inverter. 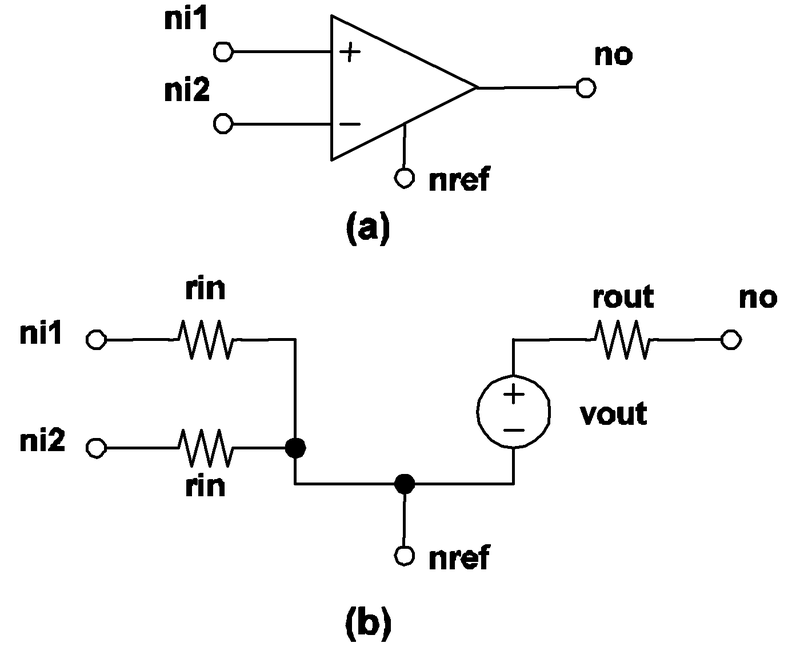 The nodes ni, no and nref are the input, output and the reference nodes, respectively. where V(ni,nref) represents the voltage of the input node with respect to the reference node. The actual model implemented in SIMPLIS for a comparator is shown in 4.9 (b). There is a resistor of value rin placed between each input node and the reference node. The output circuit is modeled by a resistor in series with a voltage source. The resistor has a resistance rout and the source value of the voltage source, vout, depends on the logic state of the output of the comparator. 4.9 SIMPLIS comparator model: (a) Symbol for comparator, (b) Model for comparator. The nodes n1, n2 are the two input nodes. 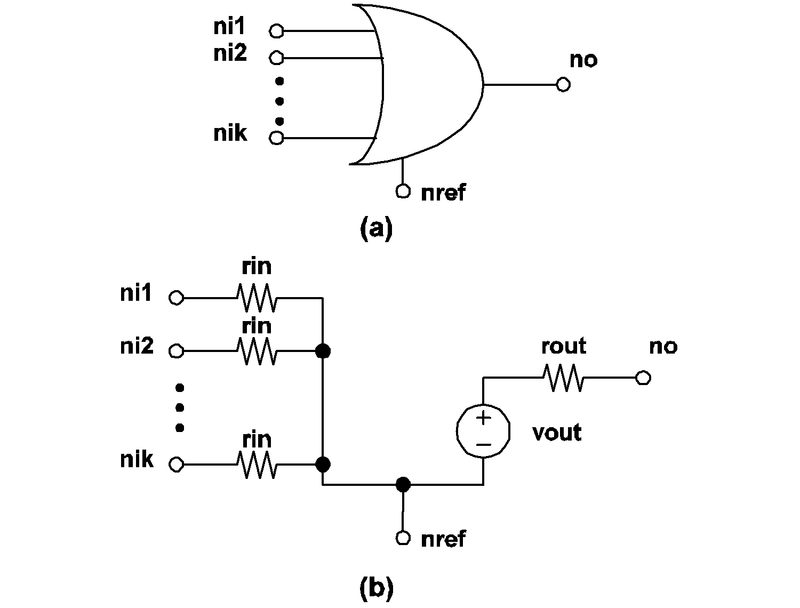 The nodes no and nref are the output and reference nodes, respectively. where V(ni1,ni2) represents the voltage of the first input node with respect to the voltage of the second input node. NEG is the three-character keyword "NEG"
4.10 Exclusive-OR gate model: (a) Symbol for exclusive-OR gate, (b) Model for exclusive-OR gate. The nodes ni1 and ni2 are the two input	nodes. 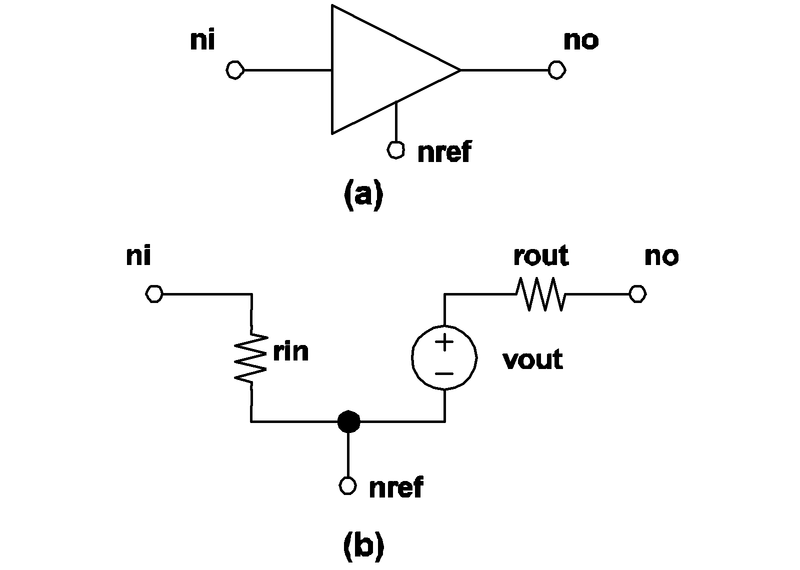 The nodes no and nref are the output and reference nodes, respectively. The actual model implemented in SIMPLIS for an exclusive-OR gate is shown in 4.10 (a). The source value of the voltage source, vout, in the output circuit depends on the logic state of the output of the gate. The output state is equal to the result of the boolean EXCLUSIVE-OR operation on the two input states. 4.11 k-Input OR gate model: (a) Symbol for k-Input OR gate, (b) Model for	k-Input OR gate. The nodes ni1 and ni2 are the two input nodes. Up to a	maximum of 9 inputs can be accommodated. The actual model implemented in SIMPLIS for a k-input OR gate is shown in 4.11 (b). The output state is equal to the result of the boolean OR operation applied to the k input states. The output state is equal to the result of the boolean NOR operation applied to the k input states. The output state is equal to the result of the boolean AND operation applied to the k input states. The output state is equal to the result of the boolean NAND operation applied to the k input states. NEG is the three-character keyword "NEG". The actual model implemented in SIMPLIS for an S-R flip flop is shown in 4.12 (b). The set and reset input terminals of an S-R flip flop are associated with the first and second input nodes, respectively, defined in the device statement. The Q and Q' output terminals are associated with the first and second output nodes, respectively, defined in the device statement. The logic state of the output Q' is always equal to the logical complement of the logic state of the output Q. The initial condition specified in the device statement for an S-R flip-flop is used to initialize the logic output state of the normal output Q. When the logic state of the set input is equal to logic 1, the logic state of the normal output Q is set to logic 1. When the logic state of the reset input is equal to logic 1, the logic state of the normal output Q is set to logic 0. 4.12 SR Flip Flop model: (a) Symbol for a SIMPLIS S-R flip flop, (b) Model for a SIMPLIS S-R flip flop. TRIG_COND= is the ten-character keyword "TRIG_COND="
0_TO_1 is the six-character keyword "0_TO_1"
1_TO_0 is the six-character keyword "1_TO_0"
The actual model implemented in SIMPLIS for a clocked Set-Reset flip-flop is shown in 4.13 (b). The first two input nodes in the device statement are the set and reset input terminals while the third input node in the device statement is the clock input terminal. If TRIG_COND = 0_TO_1, the clocked Set-Reset flip-flop is considered to be "triggered" when the logic state of the clock input changes from 0 to 1. Similarly, a logic 1 to logic 0 transition for the clock input is considered to "trigger" this type of flip-flop if TRIG_COND = 1_TO_0. The logic state of each output will not change except at the triggering moment. At the triggering moment, the logic of the clocked Set-Reset flip-flop is same as that of the unclocked Set-Reset flip-flop. 4.13 Clocked SR Flip Flop model: (a) Symbol for a SIMPLIS Clocked S-R	flip flop, (b) Model for a SIMPLIS Clocked S-R flip flop. The actual model implemented in SIMPLIS for a clocked J-K flip-flop is shown in 4.14 (b). The first two input nodes in the device statement are the J and K input terminals while the third input node in the device statement is the clock input terminal. If TRIG_COND = 0_TO_1, the clocked J-K flip-flop is considered to be "triggered" when the logic state of the clock input changes from 0 to 1. Similarly, a logic 1 to logic 0 transition for the clock input is considered to "trigger" this type of flip-flop if TRIG_COND = 1_TO_0. The logic state of each output will not change except at the triggering moment. At the triggering moment, the logic of the clocked J-K flip-flop is same as that of the unclocked Set-Reset flip-flop with one exception: if the states of both the J and the K inputs are equal to logic 1 at the triggering moment, the states of each output of a clocked J-K flip-flop will be set to the complement of its logic state right before the triggering moment. Hence, if the state of the normal output Q is equal to logic 1/0 right before the triggering moment, it will be set to logic 0/1 at the triggering moment if the states of both the J and the K inputs are equal to logic 1 at the triggering moment. 4.14 Clocked J-K Flip Flop model: (a) Symbol for a SIMPLIS Clocked J-K	flip flop, (b) Model for a SIMPLIS Clocked J-K flip flop. The actual model implemented in SIMPLIS for a clocked data flip-flop is shown in 4.15 (b). The first input node in the device statement is the Data input terminal and the second input node in the device statement is the clock input terminal. If TRIG_COND = 0_TO_1, the clocked data flip-flop is considered to be "triggered" when the logic state of the clock input changes from 0 to 1. Similarly, a logic 1 to logic 0 transition for the clock input is considered to "trigger" this type of flip-flop if TRIG_COND = 1_TO_0. The logic state of each output will not change except at the triggering moment. At the triggering moment, the logic state of the normal output Q will follow the logic state of the data input terminal. 4.15 Clocked Data Flip Flop model: (a) Symbol for a SIMPLIS Clocked	Data flip flop, (b) Model for a SIMPLIS Clocked Data flip flop. The actual model implemented in SIMPLIS for a clocked toggle flip-flop is shown in 4.16 (b). The first input node in the device statement is the Toggle input terminal and the second input node in the device statement is the clock input terminal. If TRIG_COND = 0_TO_1, the clocked toggle flip-flop is considered to be "triggered" when the logic state of the clock input changes from 0 to 1. Similarly, a logic 1 to logic 0 transition for the clock input is considered to "trigger" this type of flip-flop if TRIG_COND = 1_TO_0. The logic state of each output will not change except at the triggering moment. At the triggering moment, the logic state of each output remains the same as the logic state before the triggering moment if the state of the toggle input is logic 0. On the other hand, the logic state of each output is complemented if the state of the toggle input is logic 1 at the triggering moment. 4.16 Clocked Toggle Flip Flop model: (a) Symbol for a SIMPLIS Clocked	Toggle flip flop, (b) Model for a SIMPLIS Clocked Toggle flip flop. ENABLE_LEVEL= is the thirteen-character keyword "ENABLE_LEVEL="
The actual model implemented in SIMPLIS for the clocked latch is shown in 4.17 (b). The first input node in the device statement is the Data input terminal and the second input node in the device statement is the enable input terminal. If ENABLE_LEVEL = 1, the latch is considered to be "enabled" when the state of the enable input is logic 1. Similarly, if the state of the enable input is logic 0, a latch is considered to be "enabled" if ENABLE_LEVEL = 0. The logic state of the output will not change except when the latch is enabled. When the latch is enabled, the output logic state of the latch follows the logic state of the data input terminal. 4.17 Latch model: (a) Symbol for a SIMPLIS Latch, (b) Model for a	SIMPLIS Latch.